Jenefa Rose Priya Thangaswamy M.D. (Siddha), Consultant, Tirunelveli, Tamil Nadu, India. Manikandan B M.D. (Siddha), Consultant, Tiruchuli, Tamil Nadu, INDIA. Visceral obesity syndrome also known as metabolic syndrome X is the bunch of medical conditions characterised by hypertension, hyperglycaemia, dyslipidemia and atherosclerotic cardiovascular disease affecting, nearly 240 million people worldwide. In India nearly 10000 people were affected per year and overall it goes on escalating steadily due to amplified adulterated human behaviours. There is a need of exigency at this juncture by knowing its complex pathology to condense human anguish and financial load. Siddha system of medicine primarily describes as it may arise due to provocation of the humours of the body. When our moral code of demeanour is deprived including intemperance and deficit physical activity, there is a flawed tissue metabolism leading to metabolic syndrome (MS). Classical books of Siddha were used for literary survey and databases were also analysed with the prime terminology “Metabolic syndrome” for this systemic review. The speculative backdrop, broad set of strategy in aetiology, pathogenesis and management of MS are discussed at extent through Siddha system, in the paper which would be creditable in managing in an effectual and gainful approach. THANGASWAMY, Jenefa Rose Priya; B, Manikandan. METABOLIC SYNDROME AND THE MANAGEMENT : AN APPRAISAL WITH SIDDHA SYSTEM OF MEDICINE. 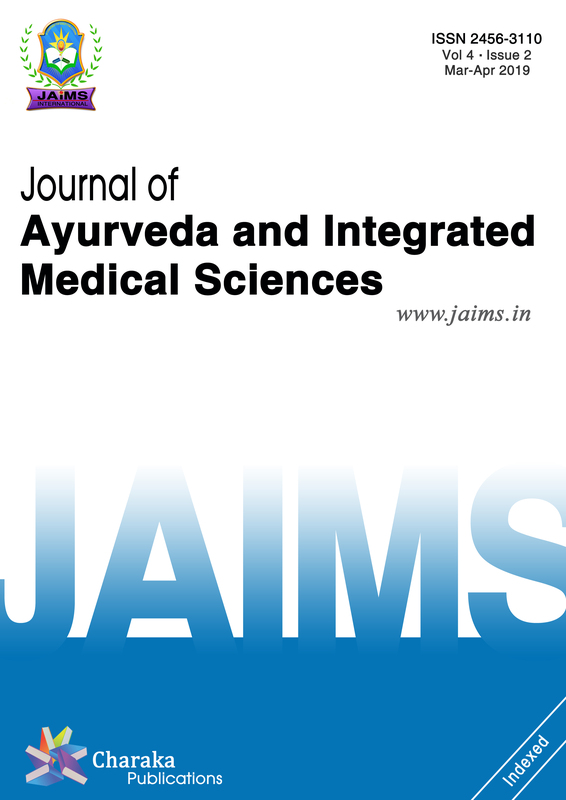 Journal of Ayurveda and Integrated Medical Sciences (ISSN 2456-3110), http://www.jaims.in/index.php/jaims/pages/view/Citation, v. 3, n. 5, p. 98 - 103, nov. 2018. ISSN 2456-3110. Available at: <https://jaims.in/index.php/jaims/article/view/689>. Date accessed: 25 apr. 2019. doi: https://doi.org/10.21760/jaims.v3i5.13825.